Sim Racing System Sim Racing System News New Raceroom Series starting March 11th! We are delighted to announce the new series for Raceroom, starting March 11th! 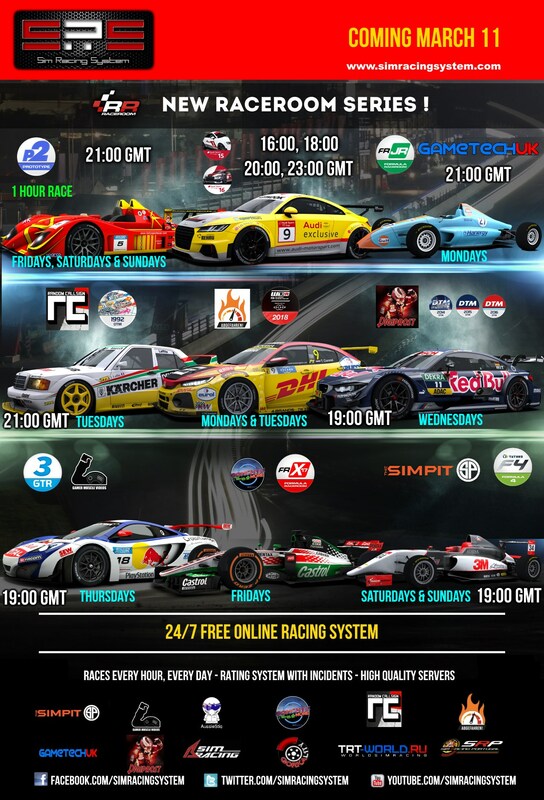 SRS will feature a P2 series on fridays, saturdays and sundays at 21:00 GMT. This races will feature a 1hour race with mandatory pitstop. AudiTT Cup 15&16 daily series running 10 min Qualify + 20 min races at 16:00, 18:00, 20:00 & 23:00 GMT. 1hr races on Friday, Saturday & Sunday’s! I don't think there are enough SRS members from Asia to fill those races. Please, more daily series with multiple schedules like Audi TT Cup and for more timezones. SRS, Thamks for all, your work with this plataform is amanzing!! Another daily race series would be an excellent addition to the SRS RaceRoom schedule.